I have been playing this one pretty close to the vest because I didn't want to get my hopes up too much, or jinx it, etc... but it looks like our house is finally selling. We have a closing date. It's been a rough journey with some rather unexpected expenses and headaches, all compounded by the fact that I'm a thousand miles away and working nights. Doing anything by phone requires me to miss prime sleeping time, and having the holidays in the middle of things made getting callbacks from some people a bit of a pain. I've been out here since the middle of June - seven and a half months. MrsZ has been out to visit three times in that period. It's been very hard trying to balance building a bit of a life out here with waiting for her so we can build OUR life out here. We couldn't have done any of this without the support and love of family and friends (new and old). When I was interviewing last year, I was given a roof and a meal by TheJack, Brigid, Pediem, and others. My parents (who I doubt will ever see this) have been an unwavering cheerleading section and have shuffled around their own schedules to help us with getting the house ready or letting in inspectors and contractors. Or mowing the lawn for us. Or shoveling the sidewalk. Another friend who as yet remains nameless has been a perfect anchor for both MrsZ and myself; listening, advising, and just being there when we needed a hug. More on that another time. We learned some very important lessons along the way... one of the key ones being "don't do major business with friends/acquaintances". If anyone in our old area wants details on that, send me an email - I'm not going to drag names in the mud publicly, but I will happily share our experiences over the last year privately. Thank you all. Seriously. It's been unreal. For the silverbugs who read, it has been on a pretty steady (albeit gradual) decline for several days and is now flirting with $19/oz. Can it go lower? Of course. Will it? Maybe a bit. 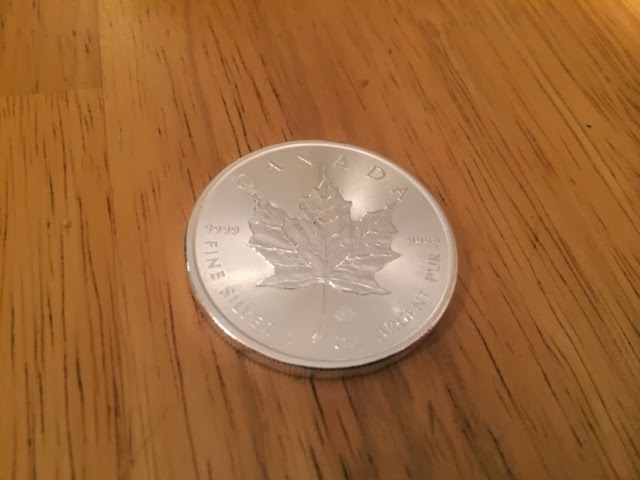 I personally feel the days of $10 silver are long gone; $20 is my "buy what you comfortably can" price and if it went to $15 I'd be looking to load up at the expense of other things. Eagles, leafs, and major name generics are a good bet. For an ounce or two, Silvertowne. For more, APMEX. Your mileage may vary, I'm not a financial advisor, etc. The capitals in the title are no accident. I have a couple of Eotech 512 sights. One rides on top of MrsZ's AR, and the other has been residing on my 300BLK Handi-Rifle. (That's likely to change, but irrelevant for the moment.) I like the sights; they have reasonable battery life, are easy to use, and for someone who can take the time to math, are fine for quick range estimation. I like the 512s because even though they're a bit larger, they run on plain old AA batteries. Both were acquired used for a shade over $300 each. New-in-box they now run $425-450ish, depending on where they're acquired. I didn't get a smokin' deal on them, but I felt I paid a fair price. One of them arrived with a bit of fade across the middle of the image. If the sight is tilted a bit off-center, the image cleans up beautifully. I hadn't bothered to deal with it yet because I don't take the Handi-Rifle out that often. Today I got a wild hair and decided to address the issue. A quick stop at Eotech's web site pointed me to their "repairs" page, where I filled out and printed the RMA form. An hour later I had an email from a tech asking for a shipping address, which I sent back. Thirty minutes after that, the RMA number and form arrived. There will be no charge for the repair. For a sight that's nearly three years out of warranty. For a sight that's on its (at least) second owner. Presuming the repair goes smoothly (and I've no reason to think it won't), Eotech has simply solidified my position as a customer of their products. I can't find the article I read earlier today, but it was a sob story from BestBuy (NYSE:BBY) regarding a poor holiday season and the resulting drop (about 30%) in stock price. The high muckey-muck they interviewed said they had expected a 2-3% increase over last year's receipts, but instead posted a 3% decrease. Finger-pointing ensued; issues with maintaining/obtaining inventory, online shopping, and such. I wrote about their woes almost two years ago, and my perception is that very little has changed. The last few times I was in Best Buy - which was before I left New York in early summer - I was faced with unhelpful staff, long lines, general ineptitude, and an overall sense of a worn-out store. BB (and Target, and others) have started trying to price-match online merchants - Amazon.com in particular - but I don't think it's made a huge difference. If it's an item I need Right Now Today, that's good to know. If I'm thinking or pondering, or I can wait two days (thanks, Prime! ), then I'll save the eight to ten percent sales tax. I really don't foresee BestBuy hanging around much longer in its current incarnation; they haven't drastically changed their business model in the last fifteen years beyond adding a much larger mobile-phone section. The world has evolved past them, and they will be another MediaPlay if they don't do some serious catch-up. Beyond that, of course... It's the economy, stupid. Workforce participation is at an all-time low. Unemployment rates are kept artificially low because people who are no longer seeking work aren't counted as unemployed. People who have jobs are facing budget cuts. Budget cuts mean no raises. Unfortunately, inflation doesn't care about that... so those of us who aren't seeing raises have less money to spend on luxury items - and BestBuy is a luxury store, no question about it. When someone is worrying about how to fill the fridge and gas tank, things like a new TV are a distant second. Cruising through the Book of Face, I noticed a picture of Jay tagged, with George Hill and Fate of Destinee. Curious to see what they had up, I clicked over to Fate's place... and she mentioned the new 1911 Range Officer 9mm. With a brief video review here. I love my Springfield GI .45; putting a 9mm in the safe next to it would be really nice. Something to save pennies for. I'm seeing suggestions here and there that retail will be right around a thousand. It sounds a little steep, but I suspect that's list and not street. The .45 Range Officer runs right around $800 on the street, which is eminently reasonable for a nicely set up 1911. As to why I would possibly want a 9mm 1911... a few reasons. First, because I want one. No more reason is really necessary. After that comes ammo cost (half that of .45, when I don't have time to reload practice rounds), familiarity (my first pistol was a 1911, I've shot IDPA with a 1911, and I am comfortable running a 1911), and finally, I have found that I shoot single-stack pistols better than doubles, for some reason I've never quite sorted out. This may make me dig into the safe to see what I feel like parting with. I've written more than a few posts on preparedness and survival. Brigid turns it up to 11. Well worth the read and making a few notes on your shopping list. MrsZ is here visiting for the holidays, and we spent a day with her brother and sister-in-law over the weekend doing SWPL. More specifically, we spent an afternoon at the Nelson-Atkins Museum of Art. My hometown has a fairly decent art museum, but nothing on this level. There is something thoroughly hypnotic - and rather intimidating - about being able to stand inches from a work from one of the masters and examine the individual brush strokes. Or stand a few feet (with a pane of glass between) from a reliquary containing a finger bone from St. John the Baptist. I am not particularly expressive about my own personal faith, but this item... is holy. Standing close to it, I quickly lost the proverbial forest for the trees. I was letting my eyes wander around the image, looking at the individual strokes, branches, background colors... until I took a few steps back and suddenly the whole picture was there to see. I spent another quarter-hour sitting on a bench in front of this piece, just looking. I'm now looking for a source for a quality print... if anyone knows one, I'm all ears. We were nowhere near seeing the whole museum - there were at least three more wings and an entire outside sculpture garden we didn't see - but that's okay. Our total cost for the day? Gas money to get there and five bucks to park. The museum is free.